If you search your ancestors in Fontanarosa, Campania, info about your Italian family are stored in the City Office archives or at the parishes. In towns and villages of Campania and in Avellino province registry offices were established in early 1800: it means that you could find information in Fontanarosa registrar as of that date. So, if your ancestors were in Fontanarosa in the nineteenth or twentieth century, then you could try to contact the City Office of Fontanarosa to know more. 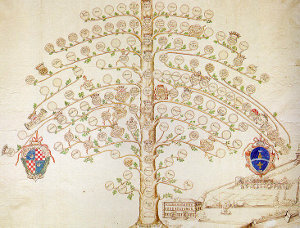 Before to start your genealogy research in Fontanarosa, we suggest you to read our tips for your search . They are useful to search in Campania and in Fontanarosa too. 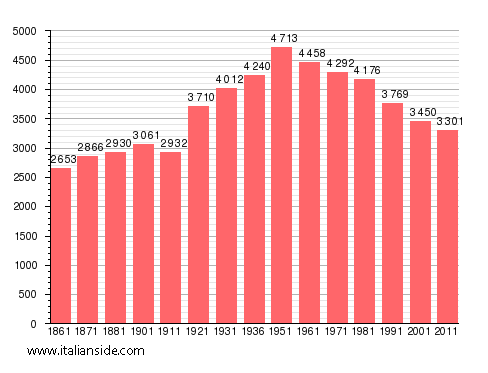 Next picture shows the demographic trends in Fontanarosa from the Italian Unification (1861) an important info to understand how many people lived there in the past. It could be important to know if the last name you are investigating is a frequent surname in Fontanarosa. As more your surname is common in Fontanarosa, as more it could be difficult to find the right info about your ancestors in Fontanarosa archives if you have not exact dates. If you have the opportunity to visit Fontanarosa and Avellino province, you could plan to investigate churches’ archives by yourself, but from abroad is very difficult to obtain any result unless you find a reliable local help. If your research is in a dead end and you need professional help from our local Italian genealogists write to fontanarosa@italianside.com our expert in Fontanarosa area will study your request and will reply to you with a research plan and a quote. Mario Scala, who was 6 when they sailed, was my grandfather. Any information anyone has about remaining family members in Fontanarosa would be greatly appreciated. We are eager to meet them! My great aunt–Elmerinda Petroccione–was born in Fontanarosa around the same time as Michele Scala and married a man with the same surname once in America (they lived in the Bronx). Her mother was a “Penta” from Sant’Angelo all’Esca too. this is the only information I have about “la famiglia Scala”. Mi dispiace. I’m looking for information and relatives of Brigida Capobianco born 1873 or 1874 in Fontanarosa, had many siblings. Information about Anthony Baldassarre and family. Born about1890. He was from Fontanarosa. Came to New York city, USA at 19 years old. I am his first grandchild. I am trying to obtain baptismal info from Santa Maria church in Fontanarosa, Italy, and would appreciate an address where to write. Any help would be appreciated. I’m researching my grandfather, Frank Rose, date of birth: 30 November 1868, in Fontanarosa. He arrived in American around June 1877. His naturalisation papers say he arrived on a ship named Rivordia Circolvia, traveling from Naples to New York. Born 30 Nov 1868 in Fontanarosa. Would like to hear from other’s researching this name. As he went by last name ‘Rose’ in America, I wondering if ‘Rosso’ was exact. Looking for information on my father Leonella or Lionella memolo came to USA early 1900’s. Had a brother Aurillo. I am researching the Di Prisco family on behalf of my mother-in-law, Marie Di Prisco Vanderhoff. Marie is the daughter of Giuseppe Di Prisco (born November 1885), and granddaughter of Pasquale and Giuseppa (Ruggiero) Di Prisco, from Fontanrosa. Pasquale and Giuseppa had 11 children, from what we know, and only two emigrated to the United States – Pasquale and a brother. Marie and myself plan to visit the area of Campania in 2015 and would like to gather as much information ahead of time so we may be able to connect with some relatives. Thank you so much for any information you can help with. The second wife of my third great grandfather was Carmella Di Prisco, he was born in Fontanarosa and I believe she was as well or possible Mirabella Eclano. After his first wife passed away, she came to the US and with his existing children and they eventually went on to have four more. Carmella Di Prisco had three siblings that I know of; Lucia (who I believe married Antonio Cappuccio), Emiddio (her brother), and Antonietta. I haven’t been able to verify this information, but someone else on ancestry seemed to think Carmella’s parents were named Pasquale Di Prisco and Rosa Moscaritelo. Any similarities here? If you would like to start a research in Fontanarosa please send your request to fontanarosa@italianside.com.